Bitcoin was invented in 2009. However, for several years it was unlikely to become a powerful financial instrument. Only a few people were interested in blockchain technologies, considering Bitcoin to be the currency of the future. And they were not mistaken – in 2017, the total capitalization of the currency exceeded $330 billion (feel free to check Coinmarketcap for more statistics). The increasing price of Bitcoin was not missed by the developers, investors, journalists and other people interested in information technologies. It became clear that cryptocurrencies’ popularity was not going to diminish, and people started creating altcoins (coins alternative to Bitcoin), hoping to improve the existing Blockchain ecosystem and to repeat the success of Satoshi Nakamoto. In this article, we will review the most capitalized alternative currencies and tell you how to make a cryptocurrency. The history of altcoins began in 2010, after Satoshi Nakamoto, the founder of Bitcoin, decided to leave his project. The development of the coin was continued by the members of the community; however, it was impossible to implement all the ideas in Bitcoin. Therefore, the most technically-skilled Bitcoin users decided to explore the blockchain technologies by creating alternative coins. 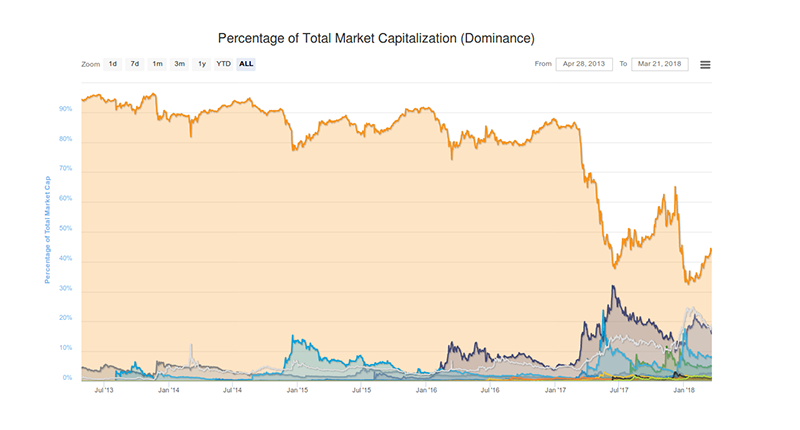 For many years Bitcoin was the only dominant in the market with about 90% of total capitalization. Although it is still the most expensive and capitalized digital currency of the day, there are alternative coins showing the dynamics of constant growth of price and capitalization. As we have already mentioned in our previous article, Blockchain is a sequence of blocks – encrypted pieces of information containing the records of the transactions. The main distinctive feature of blockchain is its decentralization: there are no servers that have the control over the transactions – all the data is stored on the computers of members of the network. Let’s see how the blockchain transactions are handled with the example of Bitcoin. the ID of the recipient’s wallet. Each transaction is signed with the unique confidential personal key (do not confuse this with the publicly available address of the wallet!). Once the payment is signed by the sender, it becomes publicly available. The transaction still needs to be confirmed so that the recipient can get the money. In order to confirm the transactions, it is necessary to generate a new block of the chain. The blocks are generated by making the complex mathematical calculations required to find the unique key. It takes 10 minutes to generate a new block, and the one who has found the key gets a certain number of coins as a reward. Once the new block of the chain is created, it is impossible to remove it from the database or to somehow change the information. Thus, the blockchain transactions are final and non-reversible. Each transaction is confirmed after 6 blocks of information are generated. The described process is called mining, and the people engaged in it are miners. Bitcoin was the first step in the era of digital currency. Since blockchain is an open-source software, you can expand the network and create your own cryptocurrency. This possibility led to the development and distribution of other coins. Not all of them were successful; however, nowadays Bitcoin is not the only cryptocurrency worth investing in. Let’s look at the 5 altcoins with the biggest capitalization. Feel free to check the actual data in the following chart. It would be a mistake to call Ethereum just a cryptocurrency. It is a software platform allowing users to create their own blockchain-based applications. The idea of Ethereum was released in 2013 by Vitalik Buterin, a 19-year old Canadian programmer and blockchain enthusiast. During the crowdfunding campaign (nowadays known as ICO), the Ethereum team managed to set a record by collecting more than $18 million. Nowadays Ethereum is the second-most capitalized cryptocurrency; however, it is not the main application of this project. 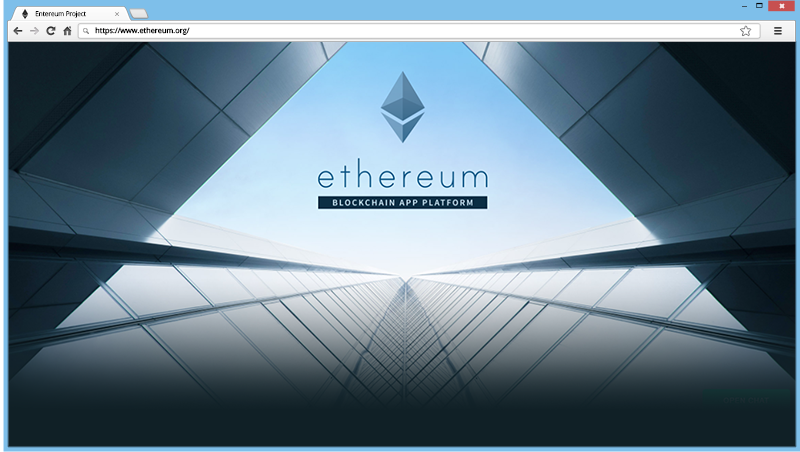 Ethereum platform allows the users to create their own applications – smart contracts. The most obvious and popular use of this platform nowadays is to make your own cryptocurrency, but the possibilities of this technology are much wider. The smart contract technology may automate not only the financial sector but also the sphere of law, logistics, consulting, real estate marketing, etc. When using smart contracts, you no longer need a third party to confirm the legitimacy of your actions – the program will do this. since its platform has a wide range of possibilities for use, it can be a suitable ground for long-term investments. Bitcoin’s emission is limited by 21 million coins and it guarantees the absence of inflation. Since Ethereum does not have such limits, its price can be affected by releasing new tokens. Ripple is a payment protocol aiming at making the international transactions faster and cheaper. Unlike the other cryptocurrencies, Ripple does not oppose itself to the traditional banks and fiat currencies. On the contrary, many of the biggest banks in the world cooperate with Ripple: Bank of America, Unicredit Bank, Santander, HBC, Commonwealth Bank of Australia. The main distinction of Ripple coin (XRP) is its centralization. The initial emission was 100 billion tokens, and nowadays, the company controls about 55% of the tokens. It is impossible to mine XRP like other coins: Ripple gives them as a reward to clients for using the power of their computers. Another interesting feature of XRP is the transaction fees. In Bitcoin, the transaction fees are used as a reward to the miners that confirm the transaction. The price of Ripple transactions is $0.00001. However, this sum does not go to any vault, it is just destroyed. This feature was implemented for preventing attacks from spammers. This fee is unnoticeable for the common users; however, in case of millions of spamming transactions the price doubles each time. The sums become more significant, and the spammers lose their money. the main idea of blockchain and cryptocurrencies is their decentralization. Ripple controls about 55% of tokens and has the opportunity to manipulate their price. At the same time, investors do not have full access to the network. Bitcoin cash is a result of Bitcoin’s hard fork in August 2017. The popularity of Bitcoin grew rapidly, and the code of the system turned out not to be ready for such a high number of transactions. Mining became more and more difficult, and the users had to wait a long time for their operations to be confirmed. If they did not want to wait, they had to pay a higher fee that made using bitcoin pointless for small transactions. The hard fork resulted in the creation of two parallel blocks, and those who had an amount of Bitcoin got the same sum in Bitcoin cash. 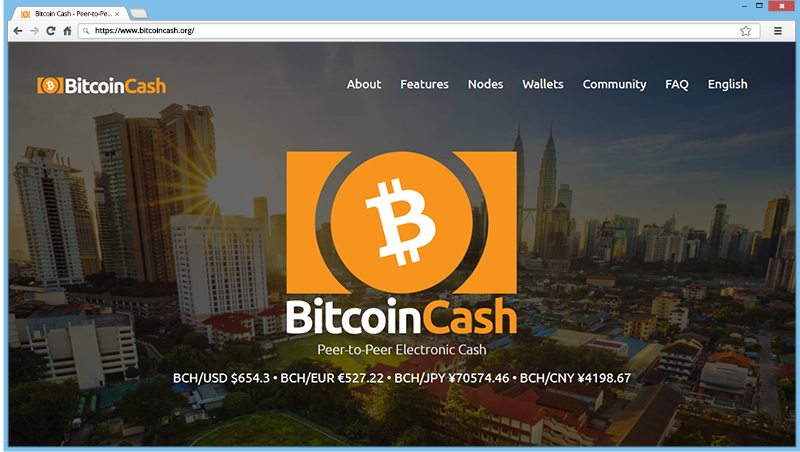 The main difference between the two currencies is the size of the block (1 MB in Bitcoin and 8 MB in Bitcoin cash). This makes BCH transactions faster and cheaper than Bitcoin ones. centralization. Bitcoin has lots of mining pools, and no one actually owns 51% of the power that gives them control over the market. Bitcoin cash has only three big mining pools that may gain the monopoly and supersede the miners with lower powers. The first widely known altcoin was created in 2011 by Charles Lee (he also developed Coinbase, the leading cryptocurrency exchange). Litecoin uses the same code as bitcoin; however, there is a different cryptographic algorithm (SHA-256 for Bitcoins and Scrypt for Litecoins). The number of Litecoin tokens is limited to 84 million, which is 4 times more than in Bitcoin. The main difference between these to coins is the process of mining. Since Srypt is less complex than SHA-256, it takes less time and power to create a new block and to confirm the transaction. Mining Bitcoin requires expensive and complex equipment and a huge amount of electricity. Litecoin uses the short-term memory and power of CPU and video cards. Litecoin was developed as an analog of Bitcoin with a different algorithm and does not implement new ideas as other cryptocurrencies do. It is a decentralized platform allowing users to create applications and smart contracts. 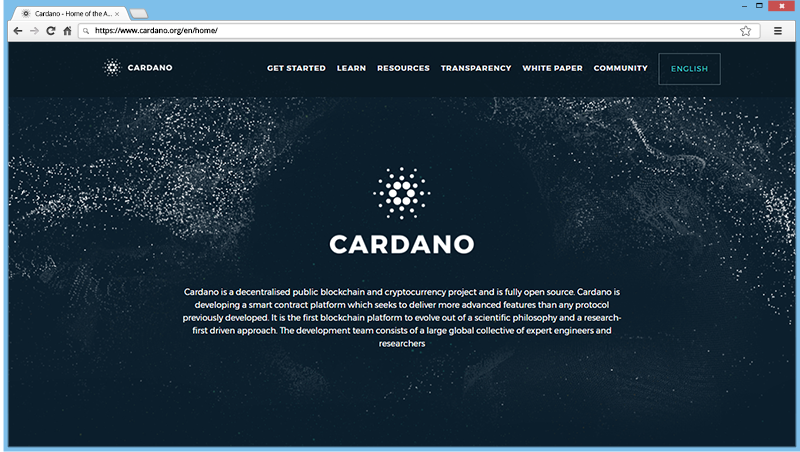 One of Cardano’s developers Charles Hoskinson used to be a part of the Ethereum team. The main distinction of Cardano is the use of Ouroboros (a modernized Proof of Stake) algorithm instead of Proof of Work confirming the transactions by mining. Proof of Work implements numerous miners making the same work on complex mathematical problems. As a result – a lot of electrical power is used, but the reward is received only by those who manage to find the solution first. In the Proof of Stake concept, the transactions are confirmed and the reward is received by those who have the biggest amount of money in their wallets. This causes a tendency towards centralization, but this problem is solved by Ouroboros. In this algorithm, the users with the biggest sums in their wallet have more chances to get the reward; however, it is not guaranteed. After research, it was officially confirmed that Ouroboros is as secure as Bitcoin’s blockchain. Creating the architecture of the blockchain and writing the code that realizes the mechanism of handling and validation the transactions. Creating the API that allows us to talk to our blockchain over the web using HTTP requests. Now you are familiar with the 5 altcoins with the highest capitalizations and know the basic process of how to make a cryptocurrency. Of course, this is the approximate data, and we shall be able to tell you the exact information after finding out more about your project and your business. Feel free to contact us if you need help with developing your altcoin. We can offer our help with developing custom blockchain using Python and Ruby on Rails.